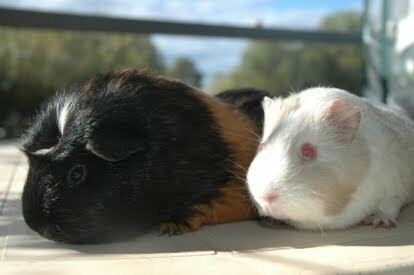 It was only a matter of days after we had moved in that my wife came home with two female guinea pigs, picked up from a home that no longer wanted them. They had been offered on the local freecycle network which we both think is a fantastic resource and have steadily made more use of it over the last few months for both the giving and the receiving. Freecycle appears to have had a name change and can be located here. I’ve kept guinea pigs before, and in a permaculture setting have found them very handy and also quite rewarding as far as having a small pet goes. We got more than be were expecting though. At first I thought the strange twitching behaviour was because they were old and were getting on a bit. I figured that was why someone was giving them away. They looked a bit haggard. Then they seemed to be biting each other and just getting on each others nerves. I put this down to age and maybe a bit of psychotic, animal behaviour. After a few months though, my wife did a little investigating and we diagnosed them with having mange. After a few household rememdies of borax washes, shampoos and lavendar oil applications they were having some relief, but they were still not 100%. After further investigation we ended up getting a vet prescribed solution that we placed in drops over their skin in various locations. They were different animals in just 24 hours and within a month they were growing their coat back and it was a beautiful lustre and length. They literally became totally different guinea pigs to the ones we first had. It was amazing. They put on weight, they had more character and made happy little songs. They didn’t mind gettting picked up as much. Very much contented.